In this image shared on social media and verified by VOA Persian, a flash flood submerges buildings in western Iran’s Lorestan province, April 1, 2019. This article originated in VOA's Persian Service. Iran endured its third wave of flash floods in the past two weeks on Monday, with a western province being the latest to see many areas submerged as heavy rains caused rivers and dams to overflow. Video clips verified by VOA Persian and received from social media users in Iran showed floodwaters overwhelming several towns in Lorestan province. Shown above are floods in Pol Dokhtar, Lorestan province, Iran on April 1, 2019. In one clip, a house can be seen collapsing in a raging river of muddy water in the town of Pol Dokhtar. Shown above are floods in Mamulan, Lorestan province, Iran on April 1, 2019. In another video, floodwaters submerge buildings almost up to their roofs in the town of Mamulan. A first wave of flash floods hit northeastern Iran on March 19, followed by a second wave in western and southwestern Iran on March 25. State media say at least 44 people have been killed. In a Monday report, state news agency IRNA quoted Iranian Interior Minister Abdolreza Rahmani-Fazli as saying the recent floods have inundated about 400 towns and villages in 15 provinces and forced the evacuations of around 60,000 families from their homes. 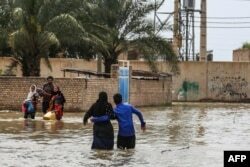 A separate IRNA report also published on Monday quoted an Iranian provincial housing affairs official as saying the floods have destroyed at least 25,000 homes across the country, according to initial estimates. An Iranian family walks through a flooded street in a village around the city of Ahvaz, in Iran's Khuzestan province, on March 31, 2019. Meanwhile, the semi-official Fars news agency cited President Hassan Rouhani as ordering authorities in flood-hit regions of western and southern Iran to use "all available capacities" to save people's lives. In some of those areas, Iranian authorities have ordered emergency discharges of water from overflowing reservoirs. Rouhani and other Iranian officials have come under sharp criticism from Iranian social media users, who accused them of being aloof and too slow to respond to the first two waves of flash floods.